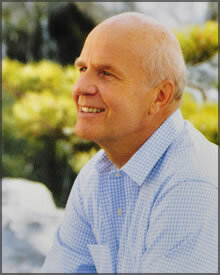 Dr. Wayne Dyer is one of the most popular self-empowerment speakers and authors in the world. Although his childhood years were difficult, spending time in orphanages and foster homes, his personal struggle to overcome these obstacles and make his own dreams come true has inspired thousands of fans who refer to him as the “father of motivation.” When he’s not traveling the globe delivering his uplifting message, Wayne Dyer is writing from his home in Maui. Dr. Dyer has written 30 books, recorded numerous audio programs, has appeared on over 5,200 television and radio programs including Oprah, The Today Show, and The Tonight Show, and has been interviewed in dozens of popular magazines. In 1985 he was selected as one of six prominent Americans, and his “A Letter to the Next Generation” appeared in Time magazine. A psychotherapist, Wayne Dyer received his doctorate in counseling psychology from Wayne State University and was an associate professor at St. John’s University in New York. He has taught at many levels of education bringing self-empowerment to students from high school through graduate study. Dr. Dyer’s unique approach to life includes a focus on spiritual as well as mental and physical energy.